The first IKEA store opened in Sweden 1958 and today IKEA has over 400 stores in 49 countries. IKEA is a family owned, value-based company with the ambition to produce affordable products that are good for both people and the planet. Close to one billion people visit IKEA every year, and of those, 660 million enjoy the IKEA Food offer. IKEA Food had a turnover of €2 billion in fiscal year 2017 and 18,000 co-workers work within the IKEA Food business around the world. Food has always been an important part of IKEA. (In fact, the first IKEA store in Älmhult included a restaurant!) Today, IKEA restaurants, IKEA Bistros, and IKEA Swedish Food Markets are central parts of the IKEA concept. Approximately one-third of all food produced in the world goes to waste. More than 1 billion tons of food are wasted per year while one in nine people around the world is undernourished. One-fourth of the food currently lost or wasted globally could feed 870 million hungry people in the world. In light of this, IKEA wants to help lead the fight against food waste. Everyone has a role to play in preventing and reducing food waste, from farmers and manufacturers to retailers and consumers. While a significant amount of global food loss and waste happens at the farm or factory, the majority happens in kitchens (at home, in restaurants, schools, offices, etc.). IKEA is taking responsibility for its global reach, and recognizes that small changes can make a great difference. One must also lead by example, which is why IKEA is measuring waste within its own operations in restaurants, bistros, and Swedish Food Markets around the world. Through the “Food is Precious” initiative, IKEA is working to reduce food waste within its stores as well as to inspire further action from others. The global “Food is Precious” initiative started in December 2016 and concerns, as a first step, the food waste in IKEA’s own kitchen and bistro operations, the IKEA Swedish Food Market, and the next step will include the plate waste from the customers eating in the stores. By 2020, all IKEA stores will have implemented the food waste initiative and over this period it will expand to include both pre- and post-consumer food waste. 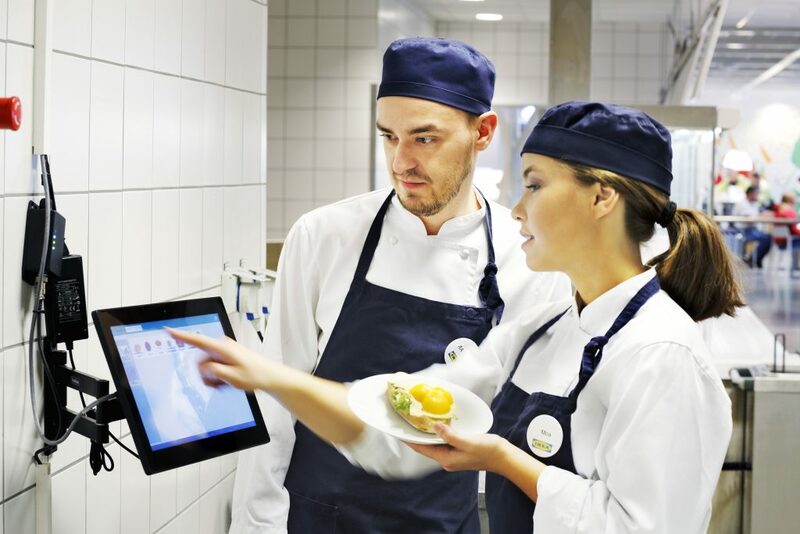 In the first phase of the program, “smart scales” are being used to measure the food thrown away in IKEA’s direct operations at restaurants (in the kitchens), bistros, and Swedish Food Markets. Co-workers use the scale to weigh the food waste, categorize it, and identify the reason behind the waste. The system then calculates the cost of the waste. Using this method, co-workers can more easily identify common factors behind food waste and develop solutions to reduce waste. The data collected when weighing and registering food waste helps IKEA identify ways to prevent food waste. Analyzing the data enables IKEA to be more efficient in forecasting and in their use of raw materials. It also provides a holistic and informed view of the company’s food operations, which allows IKEA to analyze how different parts of the operation can affect food waste. Measuring food waste at the company level also raises awareness among co-workers. Surveys show that 50% of co-workers who are working with the initiative are inspired by IKEA’s leadership and are taking steps to reduce food waste at home. So far, measurement of food loss and waste and implementation of food loss and waste reduction strategies has been a resounding success at IKEA. Financially, stores tend to “break even” after 20 weeks of implementation, including direct food cost only. Additionally, over the first 12 weeks of implementation in a store, IKEA has seen an average waste reduction of 20%. The first stores that implemented the program (in a pilot) more than two years ago have maintained their level of waste reduction in their operations, proving that these results are long-lasting. Setting clear goals and measuring have been key to the development of “Food is Precious,” as has the ease-of-use of the smart scales. An engaged management team and inspired co-workers have been of utmost importance in the project. Sharing results regularly has also been a valuable tool while implementing the system globally. IKEA set a clear, ambitious goal to halve food waste even before its campaign was fully ready for implementation. It was extremely valuable when implementing the program in the markets to have a clear goal and to have test results that showed that the goal was realistic and reachable. That sparked motivation among co-workers who play a very important role in the food waste initiative at IKEA. Establishing thorough groundwork with an extensive test period in IKEA’s own operations was crucial when implementing the program on a global scale. Taking one step at a time and continually evaluating and adjusting during implementation has also been essential. The idea to create a program around food waste at IKEA was circulated among IKEA management in the fall of 2014, and the pilot program was prepared during the winter of 2014-15. This included extensive research and evaluation of suitable systems to use, as well as deciding which IKEA stores should run the pilot. In February 2015, 4 IKEA stores – 2 in the UK and 2 in the US – started pilot programs with the help of two vendors: LeanPath and Winnow Solutions. Though initially scheduled for three months, the pilots were extended to six months to secure more reliable results. The pilot program resulted in a 23-54% decrease in food waste over 6 months of using a “smart scale” system. Concrete results from this extensive pilot program were a key factor in getting the IKEA co-workers on board to implement the program, both on a management level in each of the IKEA markets and within the operation of each store. IKEA believes that the “human factor” is key to the success of implementation. Implementing a food waste reduction program requires people to change their behavior. Thus, it was very important to IKEA that Food Waste Champions were appointed in each store based on co-workers who got a key role in implementing the program in stores and those who would motivate their colleagues to reach the ambitious goal of halving the food waste. This has proved to be very valuable for effective implementation, as well as to motivate co-workers to change their behavior when it comes to food waste both at work and at home. In this video, an IKEA Food Waste Champion shares her experience working with the program. IKEA has designated a “Country Implementation Responsible,” or CIR, for every market in which the program is implemented. These CIRs are tasked to spearhead implementation in the country and provide relevant support and motivation for other co-workers. Additionally, every store has identified a co-worker who is a “Food Waste Champion.” Champions take on the extra responsibility of ensuring that the program is used as intended and to motivate others to engage in the program, also when the program is transferred into being more of a line-business. IKEA decided early on to share the progress and the results of its food waste initiative. IKEA sees transparency around results as an opportunity to inspire and motivate others to take on the challenge of diminishing food waste in their own homes or operations, both within IKEA and outside of the company. Results are shared monthly on an internal IKEA website available to all markets, and IKEA has shared the results externally on different occasions such as the EAT conference in Stockholm and a Champions 12.3 event during the New York Climate Week. The results will also be shared in IKEA’s annual Sustainability Report. Additionally, results have been shared on IKEA Food Services Instagram account. IKEA has made reasonable efforts to report its food waste data in accordance with the Food Loss and Waste Accounting and Reporting Standard. Additional details are shared at the end of this case study. It was important that the tool used to weigh and register food waste would be simple and user friendly. The ideal is that it should be as effective as possible and not add a time-consuming task for co-workers. This has largely been the case for IKEA, though they have made minor adjustments in various programs to improve usability (e.g., limiting the number of “clicks” in the tablet to a minimum, making the icons on the tablet larger, making reports more user-friendly, moving certain data input from store co-workers to the global administration). With the large amount of other highly-prioritized activities going among the different IKEA markets, there has been a need to put extra focus on creating priorities for the Food Waste program. Sharing the business case that clearly shows the fast Return on Investment in 20 weeks and an approximate 20% reduction already after 12 weeks after implementation of the food waste solution, pointing out both the contribution to both bottom line and the IKEA values has been critical. With a presence in 49 different countries, bridging the somewhat different ways of doing things has been a necessary step. Securing resources for the implementation and the resulting follow-up (e.g., Country Implementation Responsible and a Food Waste Champion) has also been a challenge, though it depends on the size of the store and its operation, normal staff turnover, and the flexibility of management to adapt to new models. Having concrete results that demonstrate the benefits and the business case of the Food Waste program and presenting hard facts has been key to the implementation process. IKEA has faced a large challenge in aligning its work across different markets, each of which has a different culture, maturity, and perspective on food waste. IKEA has more than 400 stores in 49 countries, and is quickly expanding with the aim of opening 15 new IKEA stores every year. Each market has its own management team and different processes must be considered when implementing the program. Cultural diversity has also been a challenge as the awareness and knowledge on food waste can vary between markets. IKEA is one brand but many companies. Due to size and the different ways of working within the different companies it has been a challenge to align the technical solutions – developed by Winnow and LeanPath – with the various technical solutions in the IKEA stores. There is a variety of different IT systems in different stores, which needs to be addressed, taking time and effort. It has been a great challenge to align the various systems used across all operations. However, through continuous and close dialogue with Winnow and LeanPath, it has been easy to make adjustments along the way where these challenges have been addressed and changes have been quickly adopted. Results are already promising in the first phase of implementation and it is evident that it is possible to achieve real and good results with the food waste initiative at IKEA. The initial results show that it is realistic to reach the target of halving the food waste at IKEA by 2020 and what is as important is that the initiative has already inspired people, the IKEA co-workers, to diminish the food waste in their own homes changing the way they think about food waste. That is a great motivation for IKEA to continue to develop the program with the aim to inspire more people to diminish the food waste in their own homes and operations around the world. The second phase of the program will focus on the plate waste consumers generate when eating at IKEA’s operations. Implementation of the second phase of the program will be approached in a similar way as the first phase (i.e., adding to the test already done with an extensive pilot test in real IKEA settings before it is presented and ready for implementation in all markets). The third phase of the program will address food loss and waste with suppliers in our value chain and even how to work with the food waste initiative in product development. 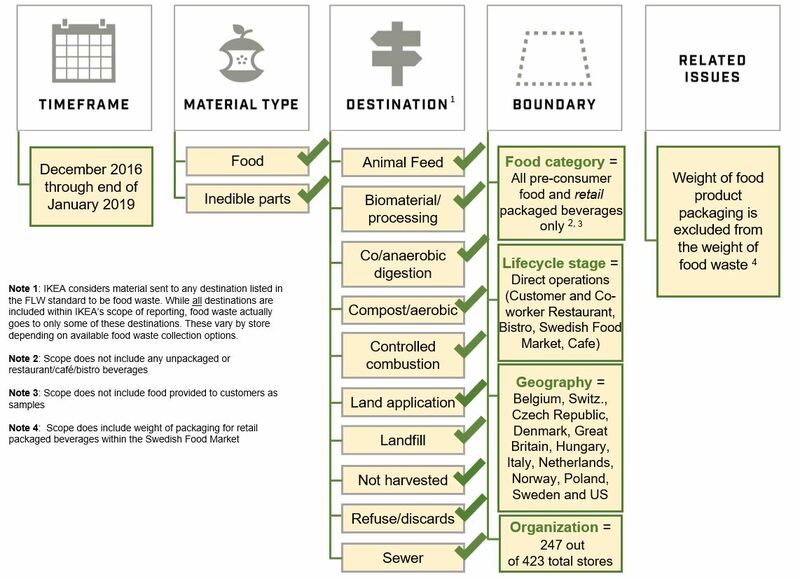 IKEA has based this food waste accounting on basic principles of relevance, completeness, consistency, transparency and accuracy. IKEA has accounted for and reported the physical amount of food waste expressed as weight in kilograms. The following figure visually represents the scope of IKEA’s current data (as of the end of January 2019) using the FLW Standard. 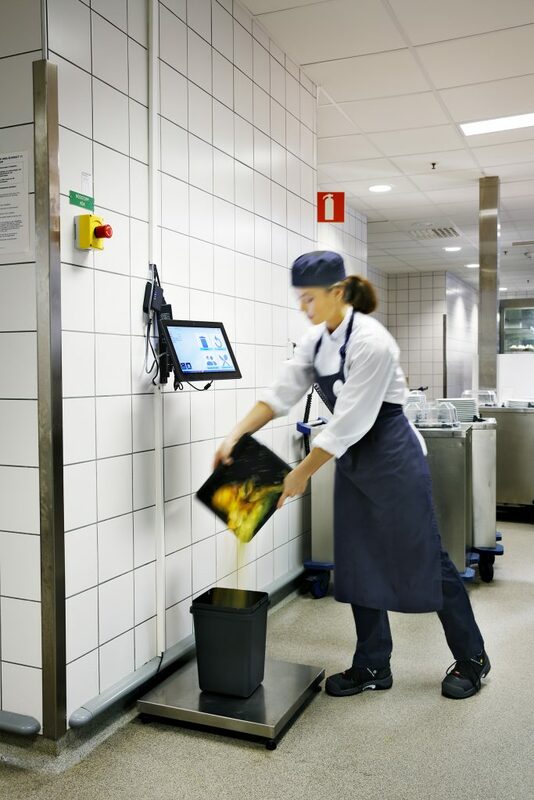 IKEA’s food waste data has been quantified using daily comprehensive measurement of all food waste with digital tracking systems from Winnow and LeanPath. The uncertainty within this data is limited to the limited risk of incomplete data capture due to co-worker participation or short durations in which tracking system may not have been available. This IKEA food waste data has not been audited or reviewed by any independent third party, however it has been compiled in coordination with two leading food waste quantification firms, LeanPath and Winnow. 1IKEA considers material (the food and associated inedible parts) sent to any destination listed in the FLW Standard to be food waste. While all destinations are included within IKEA’s scope of reporting, food waste actually goes to only some of these destinations. These vary by store depending on available food waste collection options.